Arthur Nanni talking about permaculture in southern Brazil. NEPerma and Igatu farm have a shared history. The Igatu farm began its activities in 2011 to be a place for tests and experiments developing social technologies applied to permaculture management. 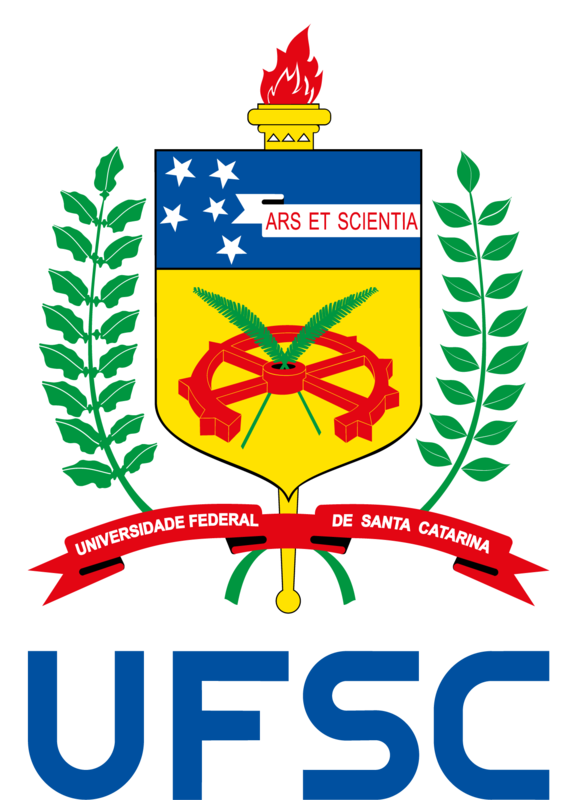 Over time, the Igatu farm was adopted as an experimental laboratory to provide content to the “Introduction to permaculture” course, a subject offered since 2012 by the UFSC Geography undergraduate program. Soon after, in 2013, the research and extension actions started by NEPerma adopted Igatu’s area as a demonstration space, offering for course participants a place to practice the knowledge learned in class. 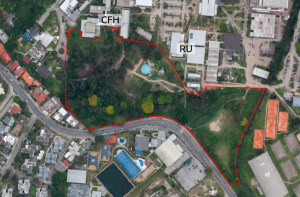 Igatu’s history was told through a “Permaculture in Southern Brazil” lecture, that was presented in November as part of Permaculture Design Course (PDC), offered by The Food Forest learning centre, situated at Gawler, a city near to Adelaide in the state of South Australia. 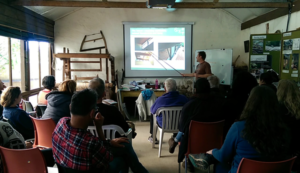 The permaculture learning centre is recognised as an exemplar of permaculture management with more than 30 years of the Brookman family’s experience. In the lecture, the permaculturist/professor Arthur Nanni showed the strategies of permaculture planning in small farms in southern Brazil, considering low impact strategies under subtropical climates. 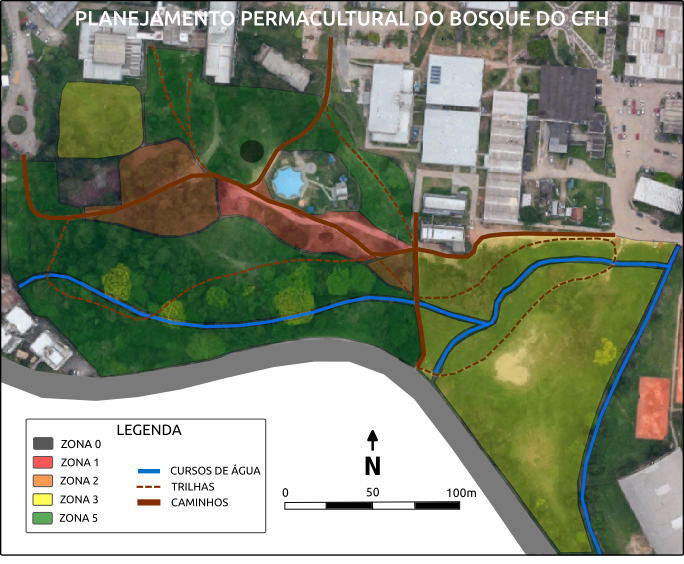 Further, he gave a brief explanation about the use of open-source Geographical Information System tools in the permaculture management of small farms. 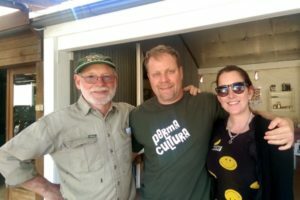 Graham Brookman, Arthur Nanni and Keri Chiveralls at The Food Forest learning centre. The PDC offered by the Food Forest respects the international syllabus, that certifies participants as permaculturists, as does NEPerma at UFSC. 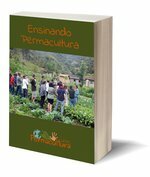 The PDC had the participation of more than ten permaculture instructors. They presented in a rich and diverse way leading to a solid and practical understanding of permaculture. One of highlights was the presence of David Holmgren, permaculture co-creator with his vast knowledge of permaculture Worldwide.